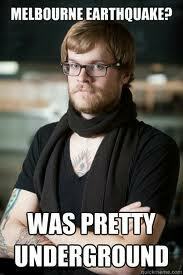 A few weeks ago a friend of mine asked me to provide him with the definition of what I thought a Hipster was. I had to choose my words carefully as he was determined to make me admit that I would consider myself to be a one of these pretentious ‘fashionistas’. Yes I must agree that I do have some ‘hipster’ tendencies as I do roll up my short sleeves and button up my top button. But I believe the true way to define a hipster is by the way they act not by what they wear. After living in East London, I thought I had seen it all, however Melbourne is a city that is crawling with these people who fall into different groups defined by their postcodes. Today I will attempt to define three different types of the Melbourne Hipster. If I could summarise the Brunswick Hipster in one word it would be dirty. Their hair is greasy and their stained clothes have been plucked from a pile in the corner of their shambolic, windowless bedroom. They are far louder and more confident than any of the other hipsters who are splattered around Melbourne and you are more likely to overhear their conversations when catching the Upfield train from Jewell station. The Brunswick hipster’s congregate in bars on Sydney Road like The Retreat or The Penny Black and drink their cheap Melbourne Bitters out of long neck bottles. The appalling nineties trends seem to be making a comeback with the kids in this suburb, recently I have seen satin South Park boxers peeking out the top of baggy jeans and choker style necklaces once made famous by the Spice Girls. To me Fitzroy is original home of Hipsters in Melbourne. The streets are lined with all sorts of stores, bars and cafés that are basically set up to cater for the psychographic in their neighbourhood. You can do a spot of vintage shopping and buy something that’s only ten years old but double its original value or grab a vegan, organic, gluten free, low carb pastry from various cafes to go with your ‘magic’. The Hipsters in this neck of the woods are rich enough to buy packeted cigarettes (or simply too un-coordinated to roll their own). They pose behind round glasses on the outside tables of cafes on Brunswick Street just to get noticed by passer-by’s and talk about the things that normal people are far too stupid to understand. The boys have top knots and the girls messy buns and will all have their ankles on show even in the coldest Australian temperatures. Perhaps the most authentic hipsters of all, but I do not mean that as a compliment. The Hipsters I have come across on Errol Street or Victoria Street are by far the most pretentious and take Irony to the next level when it comes to their daily outfits. They are so ironic in fact that sometimes it is difficult to distinguish between a Hipster and an old lady on account of the grey hair, oversized cardigans and giant reading glasses. They all know someone who shoots documentaries for Vice and have at home studios in which they produce abstract pieces inspired by a French documentary maker you’ve never heard of. They throw big words into sentences to show off their intelligence but would probably sound a bit more human if they said ‘funny’ instead of ‘jocose’ or ‘great’ instead of ‘coruscating.’ To put it simply the North Melbourne Hipsters are too good to be seen with the likes of you or me. I write this as a complete observation and have no intention of offending anyone. But let’s face it, if you are offended by these words you’ll be far too proud to admit it. So please, pick those knitting needles back up and keep working on that beanie… Summer is only eight months away. This entry was posted in Fashion, melbourne and tagged brunswick, brunswick street, errol street, fashion, foitzroy, hipster, magic, melbourne, melbourne life, ninties, north melbourne, penny black, pretentious, retreat, sydney road, top knot, trends. Bookmark the permalink.